I thought I'd share what I'm thinking about for how we might finish the cabin interior. Of course, that's the truly fun stuff; making it a pretty, comfortable, casual place to escape to and relax in. Nothing formal or fussy or high maintenance. I plan on using fabrics that can be thrown in the wash-- and lots of slipcovers! Here is where we are right now with the cabin. Weather-tight, but unfinished on the inside. The photo below is looking out the windows on the west end. This photo is looking out the windows on the north wall. The fifth wheel is smack in the way of our lovely view. Must move it, but not sure where it should go, since I don't particularly want to see it when I look out the windows. 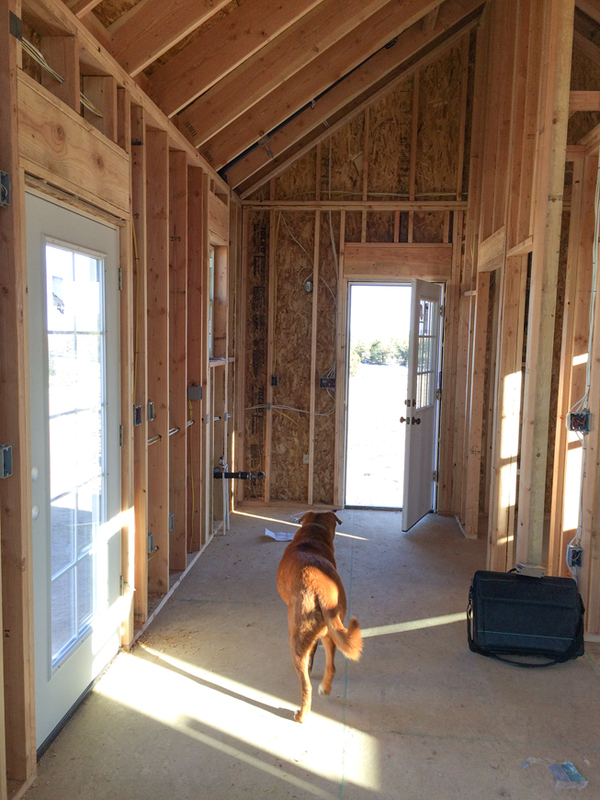 This is looking out the door on the east end of the cabin. 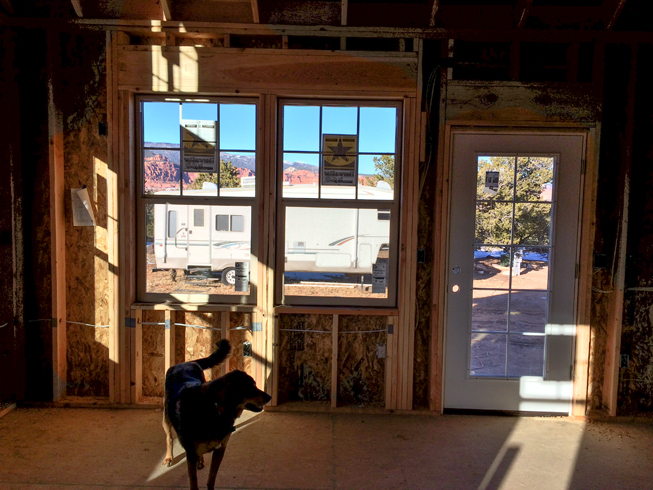 This area will be the little kitchenette, with the bathroom and closet/storage space on the right side of the photo below. Needless to say, I have been poring over magazines and Pinterest images, looking for inspiration.... of which there is plenty. 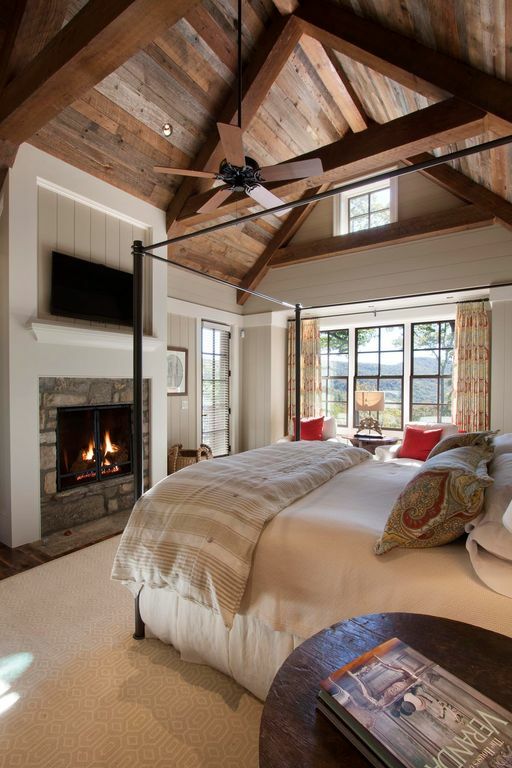 Here are some of the rooms and spaces that caught my eye. I'm currently obsessing over Sarah Richardson's style right now (hugely disappointed that HGTV no longer airs her shows). I've watched every episode of her 'Summer Cottage' series as well as 'Sarah's House Season 3' (the farmhouse transformation) over and over again via HGTV's website until the videos of her shows were no longer available. 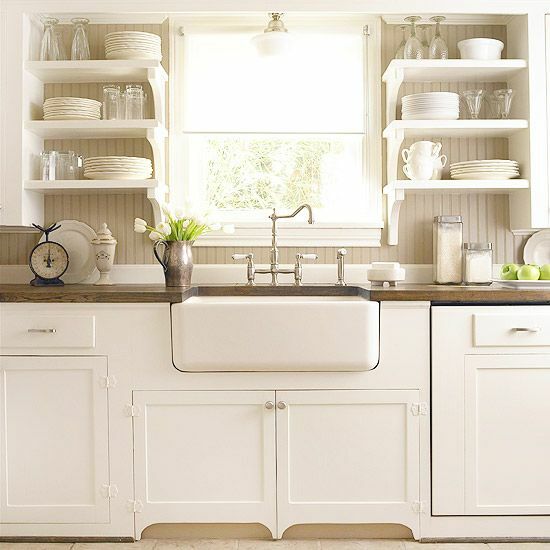 Below are a couple of my favorite SR rooms via Pinterest and sarahrichardsondesign.com. 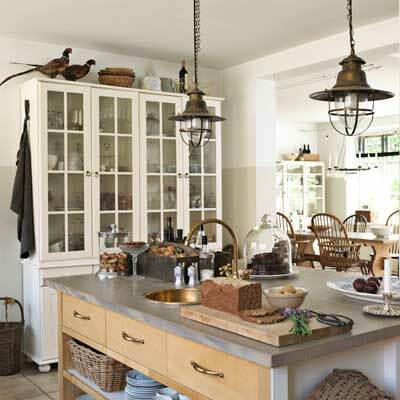 Love the use of rustic materials, wood, and soft colors in this woman's home. 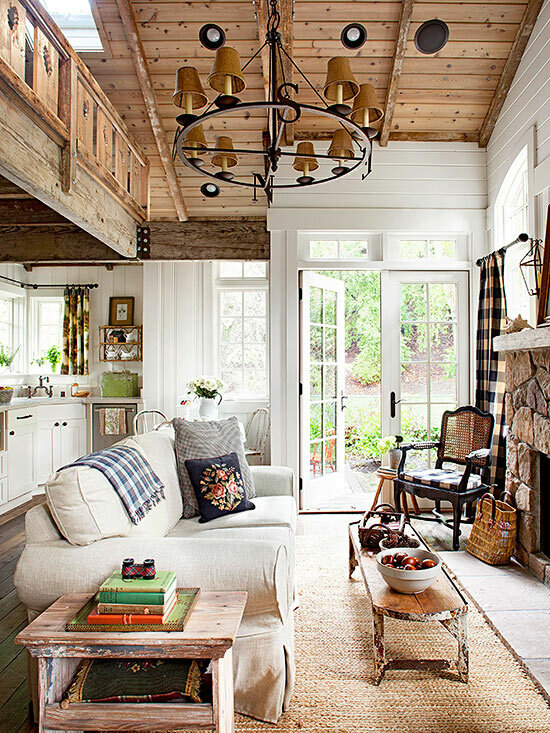 I first saw this little cottage shown below in a recent issue of The Cottage Journal and adored it immediately since this is pretty close to how we would like to finish the inside of the cabin. Stained/distressed planks on the vaulted ceiling, painted tongue-and-groove for the walls, wood floors (maybe salvaged wood... if we can find a reasonably priced source?). More salvaged wood on a vaulted ceiling. More of the fabrics and materials I'm starting to round up for the 'family room/bedroom' portion of the cabin. I'm planning on using the stock, unfinished kitchen cabinets from Home Depot to keep costs down, and painting them some shade of blue-gray (see painted square sections below), and adding hardware. I'm interested in the butcher-block-style countertops that you can get at Ikea, which are about $100 to $140 for an 8' section. Tip: sample molding pieces make are handy for trying out paint colors! The ones shown below are painted in varying shades of white that I'm considering for the walls. 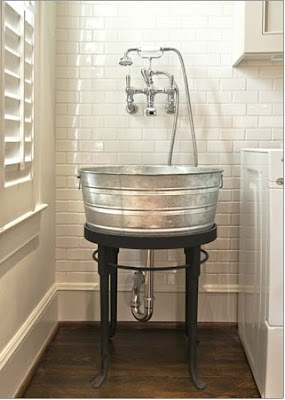 But may end up using galvanized metal tubs... I like the way this looks too (even though I believe both of the 'sinks' in the following images are in a laundry room). 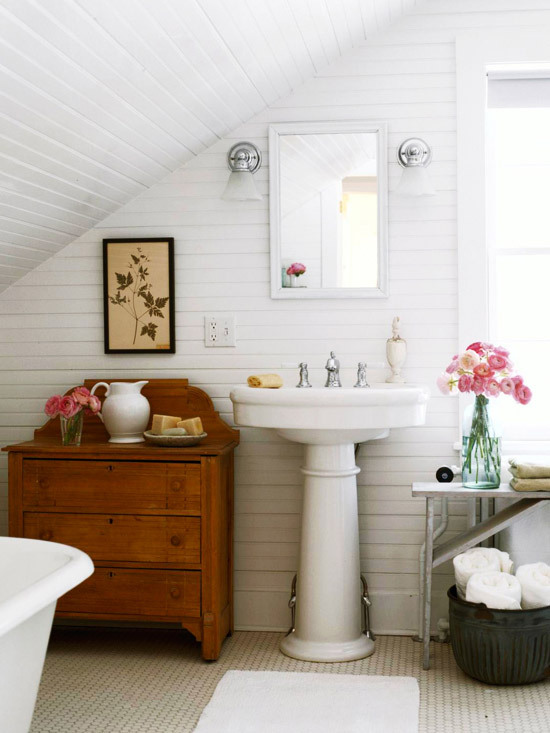 So many cute, vintage-style bathrooms out there that fit in perfectly for what we have planned for our little bathroom. Another wonderful Sarah Richardson space below. 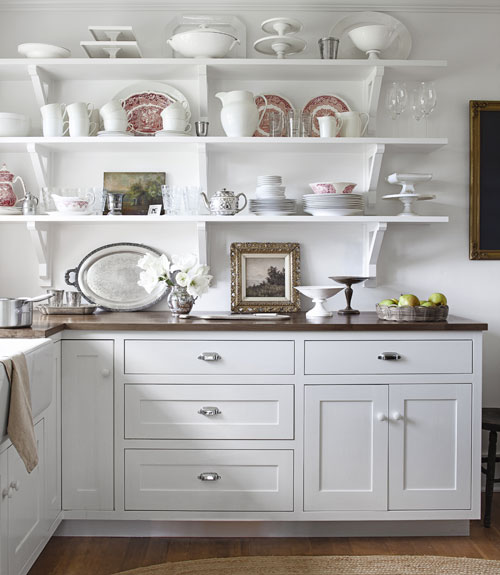 This is from the little powder room in her renovated farmhouse. Just look at that wonderful detail on the drawer front! This is just what I'd like in our cabin bathroom. 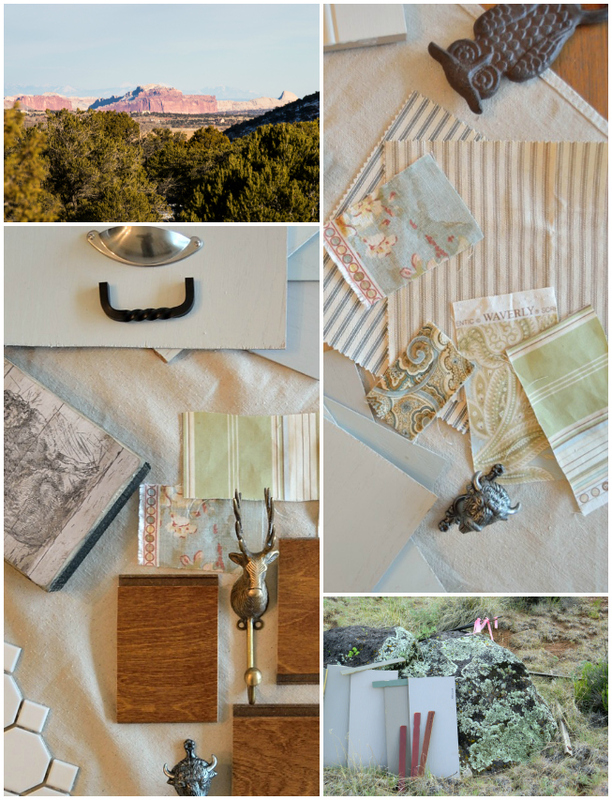 Materials and colors for our cabin bathroom shown below. Using simple, hexagonal tile will maintain the old, vintage look I'm after in the cabin, and keep costs down. 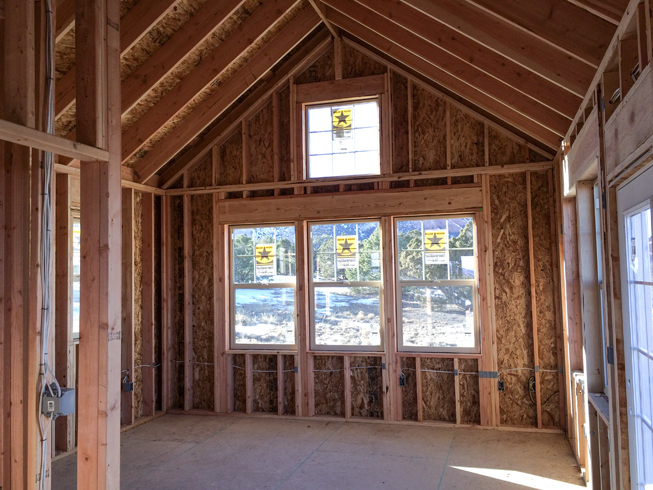 Thanks for stopping by and stay tuned for more news on our cabin project as we get to work on the interior! 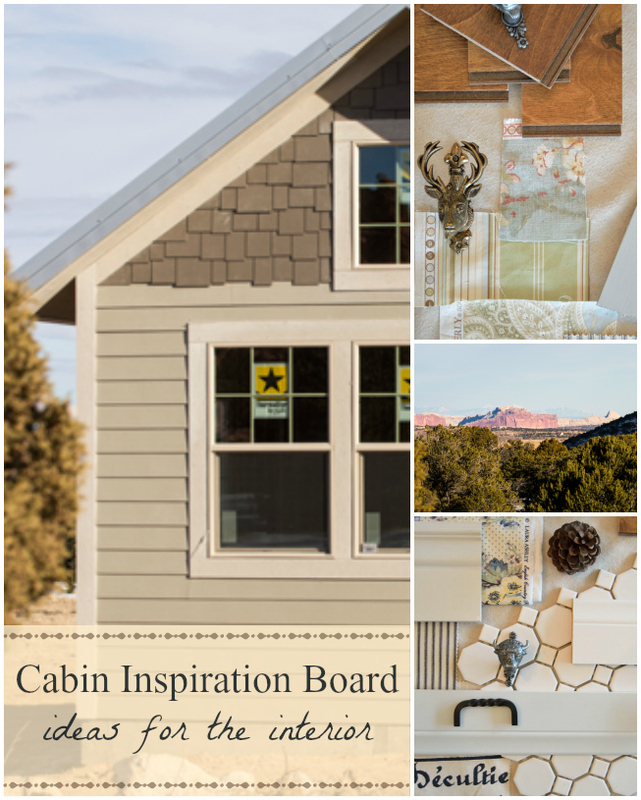 Hi Melissa, I'm new to your blog, and totally captivated by your wonderful cabin. LOVE all your inspiration and I'll be watching as you continue bringing it together! Thanks Debra! I'm looking forward to sharing more (as soon as we can find the time for another trip to Utah). What great spot for your cabin! Found you through Hometalk it will be fun to watch your design unfold.